Unlike the C: drive in Windows, Linux does not have a physical drive at its root. Instead, it has a / (slash) at the top (root) of its file system. It then mounts physical drives to this file system either at /mnt or /media. Linux uses a logical label for the drives that are then mounted on the file system. These logical labels will vary depending upon when and where they are mounted. This means that the same hard drive might have different labels at different times. The "s" is a legacy from SCSI drives. Partitions within those drives are then designated with numbers after the letters such as sda1, sda2, sda3, etc. Among the most basic commands in Linux is df. When we type it, it will provide us with basic information on any hard disks or mounted drives such as CD, DVD, or flash drives. It is usually used to quickly glance at the available space on your drives; that's why "df" stands for disk free. Note that my virtual disk on this system was designated sda1. And my 16 GB flash drive was sdb1 and my external hard drive sdc1. 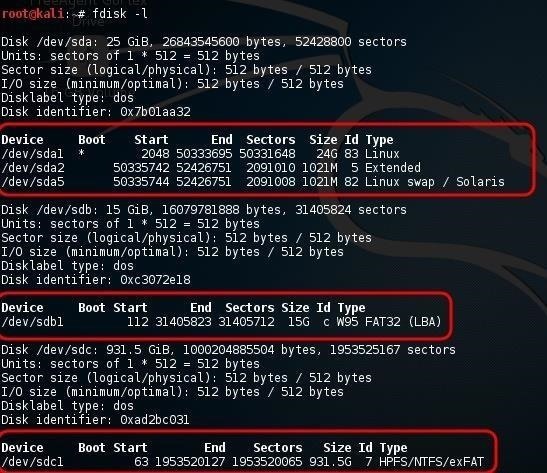 The fdsisk command is often used to determine the partitions on the disk. If we use the -l switch, it will list all the partitions of all of the drives. As you can see in the screenshot above, it lists sda1, sda2, and sda3 in the first circled stanza. 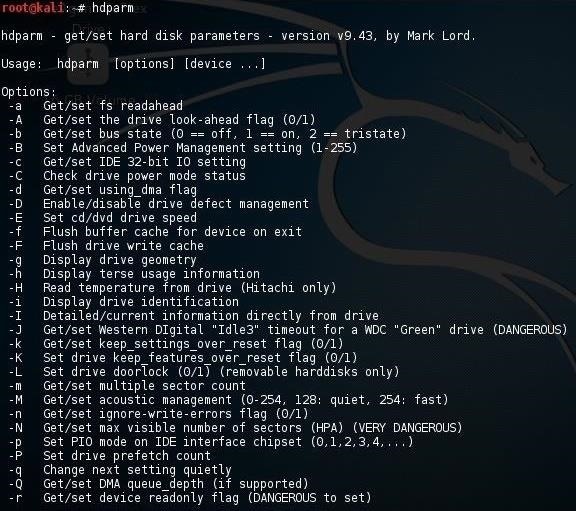 This is the virtual disk from my virtual machine that this Kali Linux is installed on. Note that it is 25 GB with three partitions including the swap partition (sda3). If we scan a bit down the screenshot to the second stanza, we see a second device output designated sdb1. This is my 16 GB flash drive. Note that fdisk indicates that it is a FAT32 filesystem type. Lastly, we see sdc1 in the third circled stanza. This is my external 1 TB hard drive. Note that fdisk indicates that it is a NTFS file system. In Linux, devices are categorized as either block or character devices. Character devices are such devices as keyboards and printers. Block devices are hard drives, DVD devices, and flash drives, among others. We have a command, lsblk (list block), that will list some basic information about each of the block devices. It will also display the devices in a kind of tree, showing each device with branches of its partitions. An example would be sda with the branches of sda1, sda2, and sda3. Note in the output above, it also includes fd0 (floppy drive) and sr0 (DVD drive). Additional information included here is the mount point of the drive. Note that both of my external USB devices are mounted at /media/root. As you can see, parted then provided us with just the information on that single partition, my FAT32 16 GB flash drive. We can use parted to create and edit partitions, but I don't recommend it for beginners—without knowledge and experience, one is likely to cause more damage than good. hdparm is a powerful utility that enables us to change and edit the parameters of the hard drive. This can be useful in applications such as forensics, but can be very dangerous without sufficient knowledge. I introduce it to you here as we will be using it in my forensics series in the near future. As you can see from the voluminous help page above, hdparm is capable of altering and editing just about any parameter of your hard drive. To become a professional hacker, you must be competent in Linux. I hope this series will continue to develop your Linux skills, thereby assisting you in your goal of becoming a professional hacker. Keep coming back, my neophyte hackers! This series of articles seems to get less attention than everything else, but I honestly think this is the most important of all. When you exploit a system, what exactly do you plan on doing if you don't know the OS? You need to know how a system works before you go about exploiting it. I would like to add cfdisk, which I prefer as it has more overview. This series is an enormous help, as A+ courses don't focus on Linux very hard! Thanks for sharing. It is very helpful to me as a recent convert to Linux. I'm a user not a programmer. I got infected when I purchased a Raspberry Pi. Now I'm beginning to like Linux and learning new stuff thanks to people like yourself who are not afraid to share their knowledge with others. you are creative I have a question I worked kali linux on placebo System Is it good or not? i am one of your novice hacker, who is in a problem of installing aircrack in backtrack.